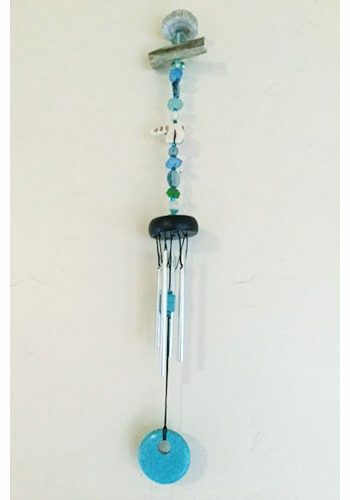 Wind Chimes and Alaskan Gifts for sale online - Alaskan Reflections. 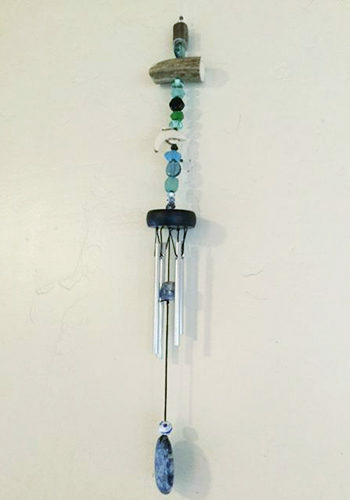 If you love the soothing melody of Wind chimes on a summer evening, I think you will find these chimes in particular are truly magical. 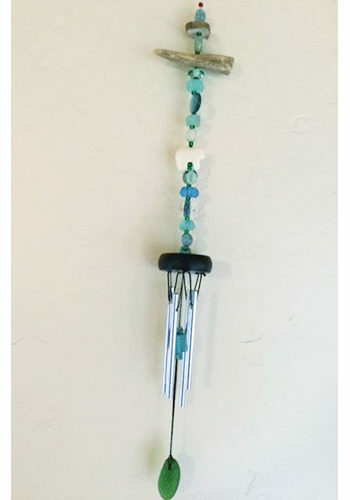 In other words if you are looking for wind chimes, these handmade sea glass wind chimes are truly a unique gift that screams Alaska. Made from the finest materials our Wind Chimes are adorned with bone carvings. They are available with either Turquoise, Jade, or Lapis colored pendants. We start with beautiful sea glass gathered from shorelines all over the great white north. Then we add a carved bone pendant, to add a little touch of Alaskan heritage. In addition we add a piece of antler, to give it that spirit of the wild. Finally you get to choose which color most reflects your tastes. 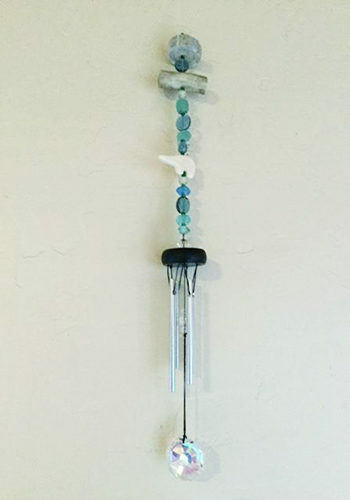 These wind chimes will gently sing to you songs of the great white north. Let the gentle song of these handcrafted chimes carry you to heart of Alaska and remind you of what Alaska means to you. Sea glass begins its life as a normal shard of broken glass. That shard of glass is repeatedly tumbled and ground. In other words the sharp edges are gradually smoothed and rounded. Throughout the course of this process, the glass loses its slick surface. However it gains a frosted appearance that develops over many years. Naturally produced sea glass finds its origin as pieces of broken bottles, broken tableware, or even from shipwrecks. The cast offs are rolled and tumbled in the ocean for many years until all of their edges are smoothed off. The Sea Glass is left with a beautiful worn frosted appearance. If you are looking to buy Wind Chimes online at wholesale prices you have come to the right place. Sign up today for our wholesale program and begin enjoying savings of up to 50% on all of our wonderful products.